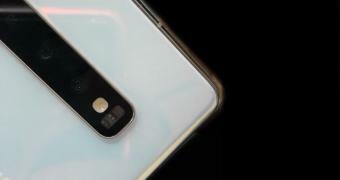 The Samsung Galaxy S10 is once again making the headlines, this time thanks to a leak coming from none other than Evan Blass, one of the most reliable sources of mobile scoops. The photo published earlier today shows what is very likely to be the Samsung Galaxy S10+ model in Pearl White version. The device looks exquisite, to say the least, and Samsung is also expected to push things even further with a ceramic version. While at first glance this leak doesn’t reveal much, the photo confirms that this particular configuration will come with a triple-camera configuration on the back and a flash placed right next to the camera bump.